Also I don't drink dairy, I eat organic as much as possible. I try to drink enough water each day but that could always be improved. I wash my face with a gentle cleanser and I tried the apple cider vinegar thing but didn't see much of a difference. I don't eat anything with artificial coloring but prescriptions I take have dyes in them so I can't avoid that but it does upset my stomach some. I do take probiotics and I am also on synthroid because I have hashinotos which has caused my thyroid to be under active diagnosed over a year ago in January 2016. I am also on dextroamphetamine because of lack of Energy been taking them since I was 17 and I am now 26. I was on birth control since I was 17 but stopped in January 2016. My skin has been overly dry this past year as well but I moisturize and avoid ingredients that would be drying. I would be inclined to say its hormonal or something in your body hone mad. change your diet to an acne friendly diet and hygene also. get rid of active stuff with benzol peroxide,when its cleared leave it.use just warm water and pat dry with clean towel and then apply moisturiser only to skin. try not to touch your face or squeeze,if an head is ready to pop do it carefully amd look after your skin. i think i got a poultry/chicken semsitivity,cos i fire up after eating chicken too often.you could be sensitive yo certain things,this is why you want to cut out all the crap junk and sugar,the usal suspects. eat veg and try not to eat different meats too often,try to eat the same mest for a week,if you fire up then it could be that type of meat makes you break out. drink plenty water and important to keep eyes on your face daily to check if its reacting and what you had day before and same day. its all about skin management. organic dairy and meat makes a huge difference! Avoid scrubs, brushes, and exfoliating sponges they spread acne all over face! I am having the EXACT SAME problem. I've seen my PCP, allergist, dermatologist and 2 estheticians. I've changed my diet, makeup, moisturizer, pillows, pillowcases and I don't hold my phone on my face. It's only in the right side too. The rest of my face is flawless. I looked up acne mapping and it suggested it was liver or respiratory. I've had both checked and there's no issues. Also had hormone checked, no issues. I'm so frustrated with the simplistic answers. A simple course of oral anti biotic from a dr could prove effective? i hate to admit it but it seems like im having the same problem with these ladies here. I already read a lot of articles. Even follow all the safety precautions but still my acne dont want to leave me alone. Help! I have a dominant side also, which I believe is hormonal. It suddenly started at 42 and I've never had any significant issues with acne before, not even my teen years. Soy. If I have a BITE of this stuff, I break out within 24-36 hours later. I read the allergen warning label on everything I eat. I have slightly low estrogen and this stuff is a strong phytoestrogen, meaning that it clogs the receptors for the real thing...estrogenic activities in your skin prevent acne (in women). If the estrogen isn't making it there...well. Peanuts...unlike tree nuts, peanuts directly increase androgens. Peanuts or peanut butter-- massive cyst(s) within 12 hours...Avoid like the plague. 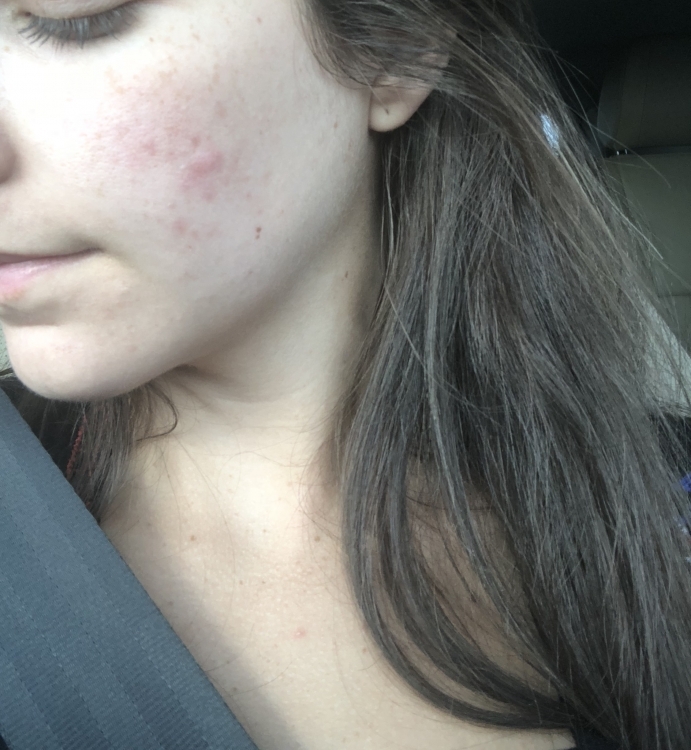 I started Differin OTC in February...how I managed that could be a separate post. AM...cleanse with Phytomer Accept cleanser. Follow with small dollop of Differin Daily Deep cleanser. Tone with 50/50 mix Witch hazel and Phytomer Eau Marine alcohol-free toner. Moisturizer...Oil of Olay complete sensitive skin, spf 15. PM...Clinique foaming cleanser (remove makeup), Clinique Charcoal cleanser, Differin Daily Deep cleanser. Toner...same as above. I really started noticing a difference after eliminating the dairy and soy after 30 days...any makeup, moisturizer, or cleanser formulated with sulfates or silicones WILL cause breakouts. 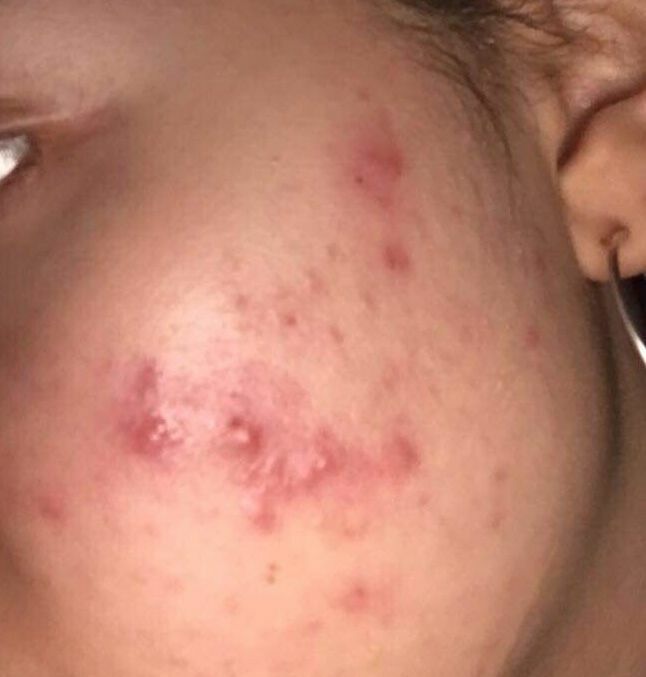 Not right away, they build up over time...I figured out thats why so many acne products will work great the first couple weeks and then start to backfire. Right now I'm using the Differin BP cleanser, because it's easy to find...if that doesn'twork long term, I have found some others worth a try. I’m having the exact same issue, also on my left cheek! 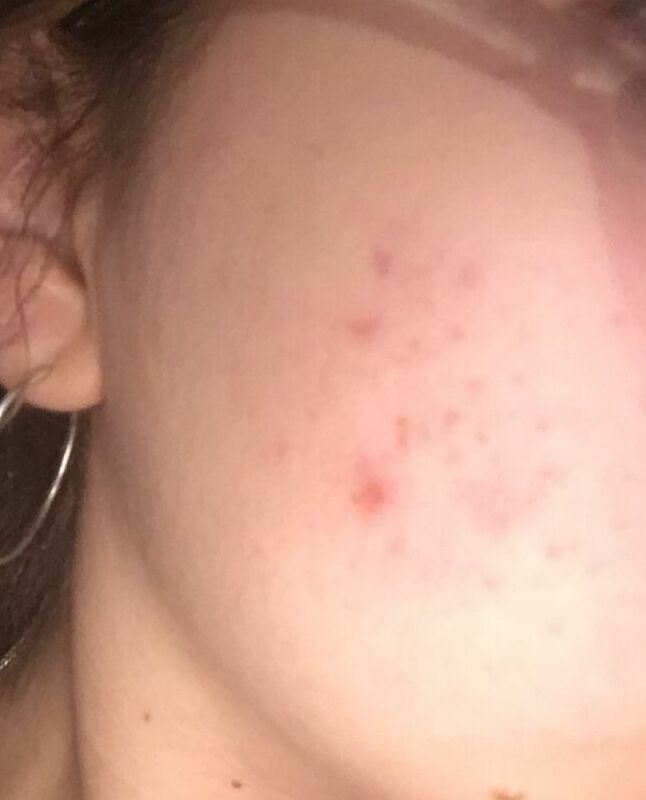 I never had acne as a teen and now at 24 they started popping up only in this area for the past 3 or 4 months. The dermatologist prescribed an antibiotic, Doryx, and a topical gel called Veltin. I try to avoid antibiotics if I can and I read horrible reviews on this particular one so I decided against taking it. I’ve been using the Veltin for a few weeks but I’ve found it makes me very oily and hasn’t done anything for the acne. 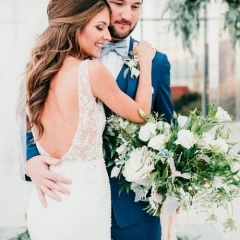 I’m getting married in 5 months and am very nervous this will still be going on let me know if you’ve found anything that seems to be helping. Good luck to you! I am having the EXACT same problem in the same area and it looks exactly the same- in the hallows of my cheeks/under cheekbone. I've been struggling for 2 years and can't find out what is triggering it. Although, I have gotten tested and it looks like my androgens are high but I can't seem to find out why. Does anyone else have digestion issues or is maybe underweight a bit?? I'm actually going to a naturopath tomorrow to get some tests done. I've been to so many doctors and they just keep prescribing birth control but I'm soo not into masking the issue. I'll keep you guys updated if I find a solution! When I reached my mid 20’s my cheeks, jawline, and chin started breaking out constantly. After struggling for a year or so I finally decided to see a dermatologist. I was prescribed an oral medication called Spironolactone and a topical called Onexton. The oral medication controls high levels androgens and is often prescribed to women struggling with adult acne. Within a few months the acne on my cheeks and jawline began to clear up and eventually stayed that way. My chin still gets a few, but it’s nothing compared to before the medicine. I just had to give it time to work. Antibiocs were not effective and not a long term solution. And I just like to stay away from antibiotics in general because they can mess with my other medications. Also, it hasn’t been scientifically proven, but many people have suggested cutting out as much dairy as possible. I have definitely noticed a difference. It’s a constant battle of trial and error until you find the right combination that works specifically with your skin because everyone is different. I do hope you find what you’re looking for. This is exactly what I have been dealing with for the last couple of years. Ugh. has anyone found anything that helps. I have adjusted my diet so much that I have become anemic. I cut out dairy and meats however I am still getting them and they just don't go away. For the last 6 months it has only been on my right side however previously it would almost alternate from side t side..
1) Cutting out Dairy (completely--read labels on everything for the 'allergen' statement at the bottom, below the ingredients list--no milk or soy), nuts, peanuts, and soy. 2) Adding IN a little fresh grapefruit and/or grapefruit juice (not from concentrate) daily. (This helps to balance the hormones/androgens). 5) NO SULFATES OR SILICONES IN MY FACE PRODUCTS. These clog pores terribly. Look at ingredients...use COSDNA.com, Google the ingredients. "Non-comedogenic" is a flat-out lie, just ignore all that advertising nonsense. My routine is VERY simple now...I wash with Clinique City Block Charcoal Cleanser (in the tube). I tone with a 50/50 mix (roughly) of Dickinson's Witch Hazel (blue label) and Mario Badescu Aloe Vera Toner. (At night I follow with a dot of Differin OTC.) That's it. If I wear makeup (hardly ever) I use Bare Minerals Original. I use their blush also. NOTE: For the first time in my life, I don't need any foundation at all...my skin is nearly flawless. So I just do my eyes. Maybe a little blusher for contouring if I'm feeling fancy. I look better without any kind of foundation. I followed the dietary restrictions RELIGIOUSLY for at LEAST six months. I mean, I NEVER cheated. After about 6 months I could occasionally indulge in a TINY amount of soy or dairy. 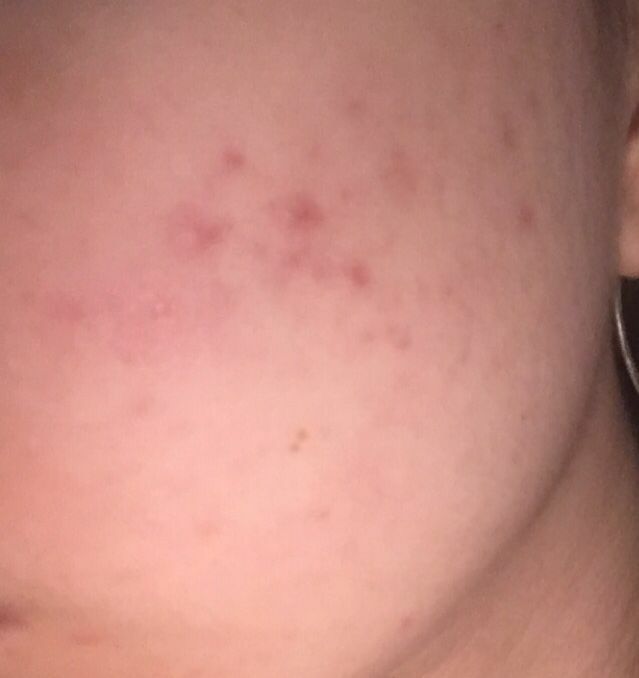 After about 9 months, I could have small amounts and not have a breakout. As of now, I'm eating pretty normally again. I eat healthy most of the time and still minimize the triggers (dairy, etc.) but I don't need to be totally free of them. I can eat out on the weekend and not worry about it and I'm fine...no breakouts. During the week, it's easier to eat really clean and healthy. Peanuts are still a no-no--they always make me break out. I'm not a doctor or dietician, so I can't give you professional advice or anything, but whenever I make big changes to my diet, I always take supplements and probiotics of some sort...I like the Garden of Life RAW probiotics. They make some that have vitamins already in them...they are good. I do it to safeguard myself from digestive issues and deficiencies.